Dhaka, Dec 20 (Just News): BNP secretary general Mirza Fakhrul Islam Alamgir on Wednesday warned the government that it will not be able return to power by jailing their chairperson Khaleda Zia. "If you think you'll fool people and return to power by jailing our leader Khaleda Zia, you're wrong. People won't let it happen," he said. Speaking at a discussion, the BNP leader further said, "We would like to tell the government that your days are numbered. You won't be able to make any gain by resorting to ploy." 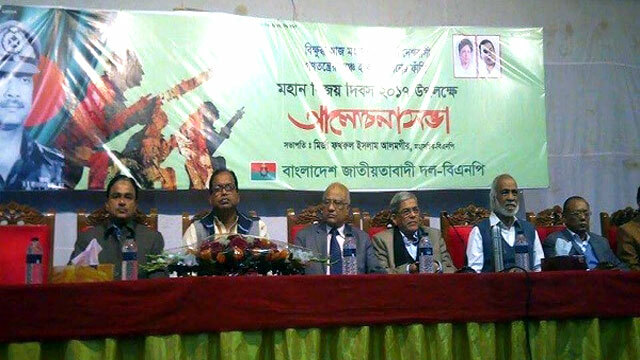 BNP arranged the discussion at Mohanagar Natya Mancha auditorium marking the 'Victory Day'. Accusing the ruling party men of looting public money in the name of mega projects, Fakhrul compared the Awami League with Bargis, a group of Maratha soldiers who had indulged in large scale plundering of people's wealth during the 18th century. "Stealing is the main policy of Awami League. They've plundered banks. Around 30 thousand crores of taka has been spent on Padma Bridge, but now engineers are saying they can't reach the riverbed. They've looted money from all the mega projects, including Moghbazar-Mouchak Flyover one. They've turned into Borgis to loot the country," he said. Referring to some media reports on Khaleda Zia's assets abroad, the BNP leader said the government is carrying out false propaganda by circulating false news by fake web portals. "We've asked them (govt) to prove it. We've sent legal notice as they failed to do so." BNP standing committee member Khandaker Mosharraf Hossain said the next general election is very crucial for the nation. "It'll have to be held under a neutral government by creating a level-playing field." He said the government is conspiring to make Khaleda disqualified for the election by convicting her by quickly disposing of the 'false' cases filed against her. "No election will be allowed to be held in the country keeping Khaleda Zia out of the race. The next election must be held under a neutral government, not under Sheikh Hasina, and the BNP chairperson will join that election," Mosharraf said. He also urged the BNP leaders and activists to get ready for a movement to hold the next polls under a neutral government foiling all the plots of the government. Another BNP standing committee member Mirza Abbas said the ruling party is out to annihilate the nationalist forces. "We've to move forward by foiling all the conspiracies." He said their party must work out their next course of action right now as the government is conspiring to convict Khaleda Zia.